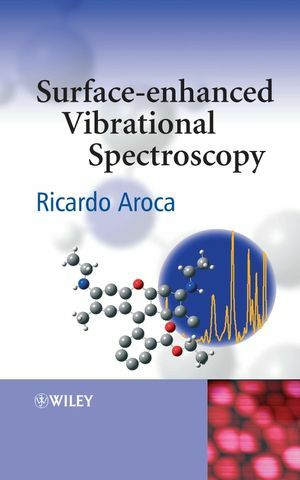 Surface Enhanced Vibrational Spectroscopy (SEVS) has reachedmaturity as an analytical technique, but until now there has beenno single work that describes the theory and experiments of SEVS.This book combines the two important techniques of surface-enhancedRaman scattering (SERS) and surface-enhanced infrared (SEIR) intoone text that serves as the definitive resource on SEVS. Professor Ricardo Aroca is based in the School of Physical Sciences, University of Windsor, Canada. He has almost 250 publications and his research interest are i) single molecule detection, ii) nanostructures for surface-enhanced spectroscopy and iii) in hydrogen storage materials. 1. Theory of Molecular Vibrations. The Origin of Infrared andRaman Spectra. 1.1 Electronic, Vibrational, Rotational and TranslationalEnergy. 1.2 Separation of Nuclear and Electronic Motions. 1.3 Vibrations in Polyatomic Molecules. 1.4 Equilibrium Properties. Dipole Moment andPolarizability. 1.5 Fundamental Vibrational Transitions in the Infrared andRaman Regions. 1.6 Symmetry of Normal Modes and Vibrational States. 1.8 The Example of ab initio Computation of the Raman andInfrared Spectra. 1.11 The Units of Energy and Force Constants. 2. The Interaction of Light with Nanoscopic Metal Particlesand Molecules on Smooth Reflecting Surfaces. 2.1 Electric Permittivity and Refractive Index. 2.2 Propagation of Electromagnetic Waves and the OpticalProperties of Materials. 2.3 Scattering and Absorption by Nanoscopic Particles. 2.4 Reflection-Absorption Infrared Spectroscopy on SmoothMetal Surfaces. 3. Surface-Enhanced Raman Scattering (SERS). 4. Chemical Effects and the SERS Spectrum. 4.1 Physical and Chemical Adsorption. 4.2 SERS/SERRS of Physically Adsorbed Molecules. 4.3 SERS of Chemically Adsorbed Molecules without ElectronicResonance Excitation. 4.4 SERS of Chemically Adsorbed Molecules with Charge TransferExcitation. 4.5 Metal-Molecule or Molecule-Metal ChargeTransfer. 4.6 SERRS from a Surface Complex. 5. Is SERS Molecule Specific? 6. SERS/SERRS, the Analytical Tool. 6.1 Average SERS on Metal Colloids. Preparation andProperties. 6.2 Metal Colloids. The Background SERS. 6.3 Metal Colloids. Maximizing the Average SERS in Solution. 6.4 Average SERS on Metal Island Films. 6.5 Average SERS on Rough Electrodes. 6.6 Ultrasensitive SERS Analysis and Single MoleculeDetection. 6.7 Uniqueness of Ultrasensitive Chemical Analysis. The MovingTarget. 7.2 Theoretical Models for SEIRA. 7.4 Interpretation of the Observed SEIRA Spectra.